The GPS maps functionality on the iPhone 3G and 3GS is decent -- it gets you from point A to point B, is free, and comes bundled with the device. But for those hungry for more features, Apple has finally released the $119.99 TomTom iPhone Car Kit that accompanies the $99 iPhone app. The TomTom iPhone app was one of the most anticipated apps revealed during June's WWDC keynote. Tom Murray, vice president of market development for TomTom, spoke to MacWorld and said that the app, in combination with the newly released Car Kit, provided an experience much like a standalone GPS unit. But is it worth dropping $220 on this combination kit? Here are some pros and cons. To be clear, this is not a review of the iPhone app or the hardware. This is simply an overview of software and hardware's pros and cons. Convenience -- Why lug around a GPS unit when everything you need is on your iPhone? The convenience of the TomTom package cannot be beat, and further goes to show that the iPhone does, indeed, do almost everything you could want it to. TomTom IQ Routes -- TomTom's IQ routes are based on the experiences of millions of users. It calculates trip duration based on actual speed limits on roads, lending users the most efficient route. Other GPS apps do not have this feature. Built-in Speaker -- The iPhone's speaker is tinny and faint; the Car Kit's speaker boasts more powerful, audible sound so you can actually make out where your next turn is supposed to be. Charges -- The iPhone's battery is inadequate for its powerful capabilities. Luckily, the Car Kit charges your iPhone, so you won't be stuck with a dead iPhone in the middle of a 3000-mile road trip. GPS Reception -- As said before, the GPS reception isn't quite what you'd find in a standalone unit. In fact, the iPhone will have more problems with tunnels and faint signals than other units. Small screen -- Most GPS units sport a 4.3-inch screen; the iPhone's screen is only 3.5 inches. While it might not make a huge difference, the smaller the picture, the harder it will be to concentrate on where you're at without plowing into a telephone pole. Price -- Yes, it's very expensive. For $120 or less you can get a standalone TomTom GPS unit, but if you choose the Apple route, all you'll get for that price is the Car Kit. 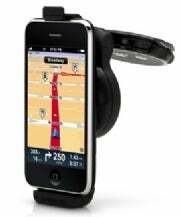 Don't forget there are other turn-by-turn GPS apps available, such as CoPilot Live, which costs only $35. Interruptions -- Plan on receiving a call during a trip? Think again. The iPhone does not allow for background processes, so the navigation must shut down. This means you'll have to make a choice: talk, or get directions. No Bundle -- Maybe this will change in the near future, but for now, you have to buy the app and the Car Kit separately. The Car Kit is useless without the app; so why not put them together? No telling if the pros outweigh the cons in this scenario -- it seems like judgments will come on a case-by-case basis. Will you buy the app and the Car Kit together, or just stick with the app? Is it worth $220 just to have TomTom on your iPhone?